We are a week post-move and I think I finally caught my breath. I continue to be so thankful to my parents' generosity in allowing us to live with them. Joanna is beside herself with joy that she's able to see her grandma and grandpa everyday. She isn't walking much more than before but she loves to stand and dance. She is crawling faster than ever. Doc wasn't concerned that she isn't walking yet so we aren't pushing her. Verbally, she is a chatty Cathy. Her favorite words are mama, dada, baba, cah (cat) and "chee koo" (thank you). My favorite sound in the world is her laugh. It's a full hearted belly chortle when she really gets going. 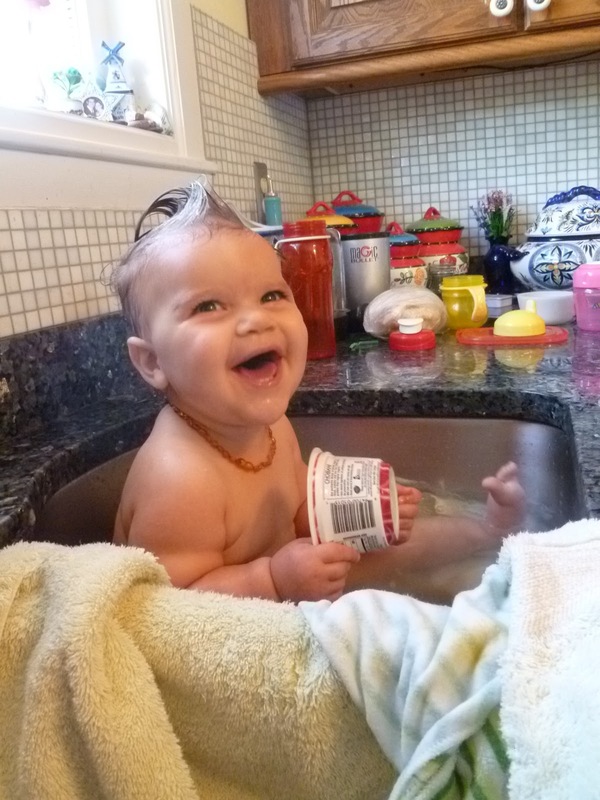 Bath times now take place in the kitchen sink. Her crib now stands where her mothers' stood. Her cloth diapers continue to cover her bum. She waves to people wherever she goes. She cuddles for a few milliseconds before plotting her escape. She loves playing with shoes, bags, and jewelry. She adores her tiny tea pot that sings with a British accent.